Designer to Create a Fashion Collection for Hot Topic? NEW YORK, NY- April 8th, 2015 – Calling all designers for the chance of a lifetime! Last year, Her Universe and Hot Topic took Comic-Con International in San Diego (San Diego Comic-Con) by storm with rave reviews and a full house for the first-ever full-scale “Geek Couture” fashion show and design competition. Now the ultimate runway for fangirl fashion is back and bigger and better for this year’s San Diego Comic-Con, the world’s premiere comic book and popular arts convention. This second annual must-see “Geek Couture” fashion show, to be held July 9th at the Manchester Grand Hyatt Hotel in San Diego, is the brainchild of Ashley Eckstein, founder of Her Universe – the trendsetting geek girl apparel company. Once again, Her Universe and Hot Topic are offering fans and amateur designers, male or female, the opportunity to submit their own women’s fashion designs based on anything that is celebrated at Comic-Con, original or inspired by popular media. The submission process opens today and designers, 18 years and older, can submit designs to be considered for the fashion show at http://www.heruniverse.com/fashionshowcontest. The deadline for submissions is April 22nd, 2015 and the 25 contestants will be selected and announced by April 28th, 2015. As with last year, two winners will be selected – one chosen by a panel of judges and the other – an audience favorite, for the unique professional opportunity to design a fashion collection with Her Universe Founder Ashley Eckstein for specialty retailer, Hot Topic. Last year’s winners, Amy Beth Christenson and Andrew MacLaine, wowed the audience with their original, handmade creations and, as a result, their exclusive Marvel Avengers Collection is premiering in Hot Topic stores and hottopic.com this May – see a sneak peak of their new collection below. This year’s Her Universe Fashion Show promises to surpass last year’s trendsetting event by providing, once again, an educational and unprecedented opportunity for designers from all over the country to show their designs to the world. Last year’s show was featured in such entertainment and mainstream media as TIME, MTV and Hollywood Reporter as well as fashion media including Cosmopolitan, Nylon and PopSugar. With last year’s social media reach for the fashion show exceeding 31+ million, this year’s event promises to reach an even greater audience. Her Universe was launched in 2010 by actress and entrepreneur Ashley Eckstein and The Araca Group, a leading theatrical production and brand management company. Ashley and Araca created Her Universe to address the expanding market of female sci-fi and fantasy fans. We entered our first agreement with Lucas Licensing to develop and produce a line of female-centered Star Wars apparel and accessories. The success of that line was followed up with a collection for BBC America for Doctor Who, and CBS Consumer Products for Star Trek and AMC for The Walking Dead, Nerdist Industries, Marvel and Hasbro for Transformers. You can learn more about Her Universe and purchase the current line of fangirl apparel and accessories by going to www.heruniverse.com and by following Eckstein & Her Universe on Facebook (facebook.com/HerUniverse) and Twitter (twitter.com/HerUniverse). Hot Topic, headquartered in City of Industry, CA, was the first retailer to make alternative apparel and accessories available to individualistic teens at malls across the country. Today, Hot Topic offers music and pop culture junkies exclusive collectibles, band merchandise, licensed and fashion apparel and accessories. Founded in 1989, Hot Topic operates 663 stores in the U.S., Canada and Puerto Rico and an online store at hottopic.com. Find Hot Topic on Twitter (twitter.com/hottopic), Facebook (facebook.com/hottopic), YouTube (youtube.com/hottopic) and Instagram (instagram.com/hottopic). 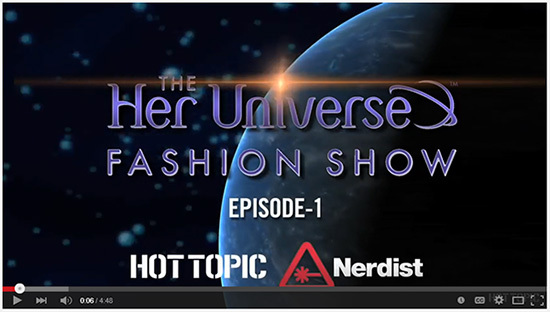 Watch the Her Universe/Hot Topic video on last year’s Her Universe Fashion Show. Original sketch that Judges Winner, Amy Beth Christenson, submitted last year during the open submission process for the 2014 Her Universe Fashion Show. 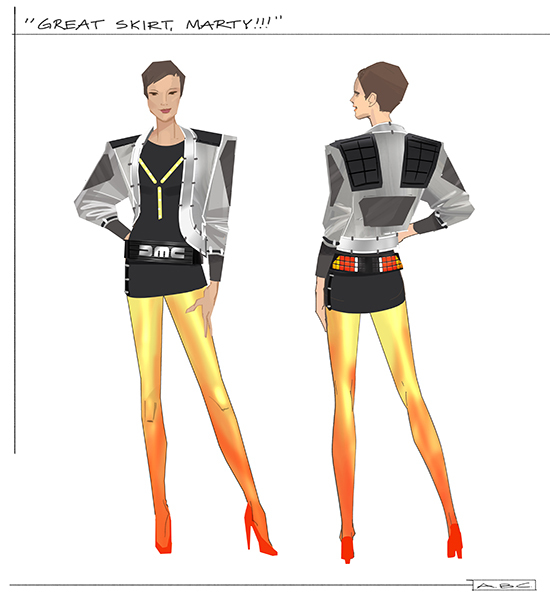 Original sketch that Audience Winner, Andrew MacLaine, submitted last year during the open submission process for the 2014 Her Universe Fashion Show. 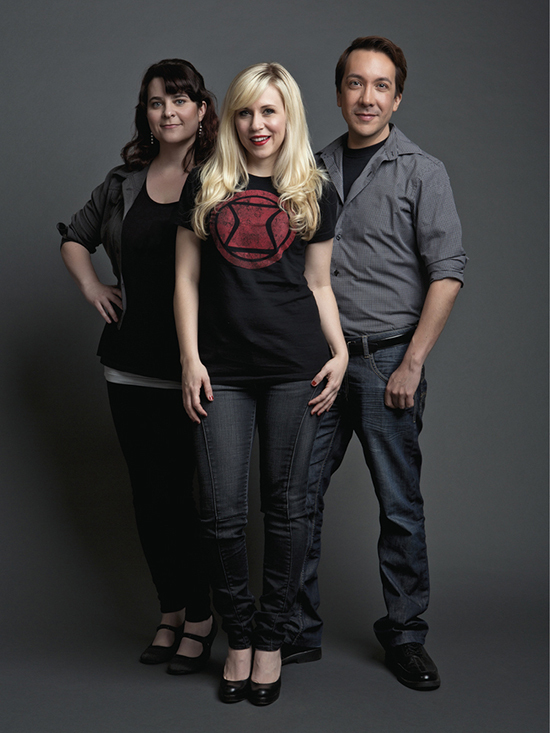 Her Universe Founder, Ashley Eckstein (center) with the winners of last year’s first-ever Her Universe “Geek Couture” Fashion Show held at San Diego Comic-Con, Amy Beth Christenson (left) and Andrew MacLaine. As part of the grand prize, Christenson and MacLaine were rewarded the opportunity to design an exclusive fashion collection with Her Universe for Hot Topic – the result of which is their new Marvel Avengers-inspired fashion collection being released in May. Part of the Marvel by Her Universe collection designed by last year’s fashion show winner, Andrew MacLaine, with Her Universe, is this Black Widow Belted Jacket available next month exclusively at Hot Topic. Part of the Marvel by Her Universe collection designed by last year’s fashion show winner, Amy Beth Christenson, with Her Universe, is this Loki Halter Dress available next month exclusively at Hot Topic. Above: Ashley Eckstein on stage at last year’s fashion show wearing her Studio Ghibli inspired gown based on My Neighbor Totoro. 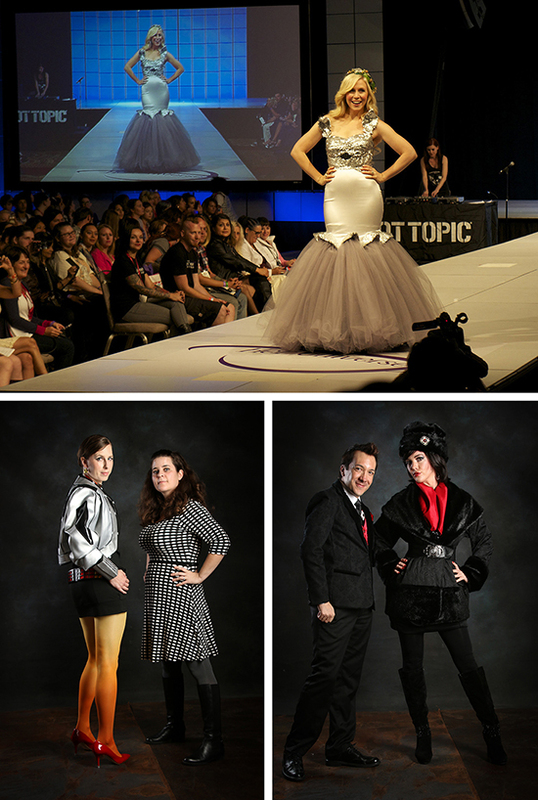 Bottom left: Last year’s Judges Winner, Amy Beth Christenson, with her model wearing her Back to the Future design. 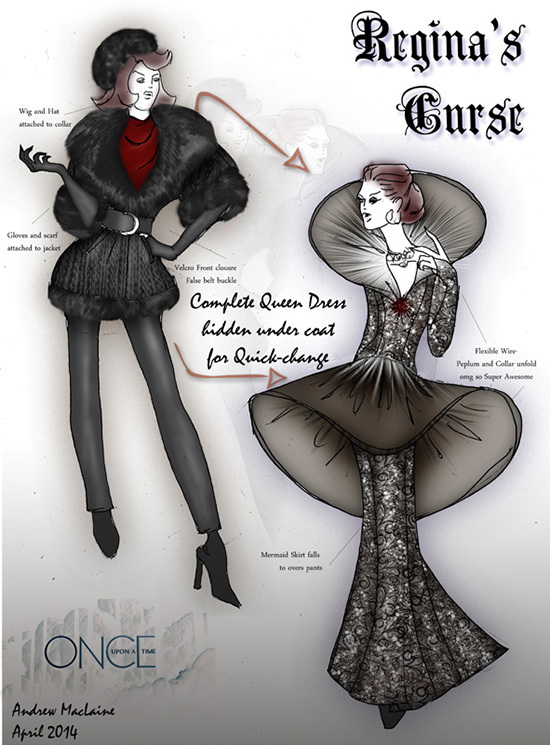 Bottom right: Last year’s Audience Winner, Andrew MacLaine with his model wearing his design based on Once Upon a Time. I would love to create some new stuff for Hot Topic in Superhero style because I quite love that so would be really happy if I could win this!